SuperPhillip Central is about ten reviews away from number 600. Do you think it'll hit it this month? Well, I'm wasting no time regardless. Today, I have a rare weekend review, and this one is of a highly anticipated Wii U third-person shooter. I never thought I'd type that sentence out! 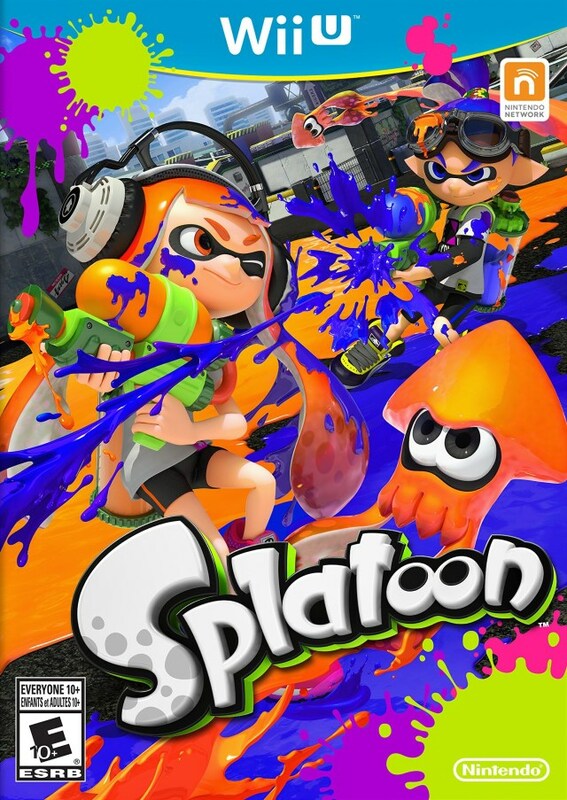 It's Splatoon from Nintendo for the Wii U! An ink-credible new IP from Nintendo, but not without problems. While Nintendo does provide unique IP, it usually doesn't do so with a major retail release. Nintendo also doesn't usually tackle certain genres outside of its usual suspects. That is until now with the Wii U's Splatoon. Judging by the quality of the game, I think Nintendo should definitely lend its hand to more nontraditional genres as Splatoon is an absurdly creative take on the third-person shooter genre, offering superb controls, addicting gameplay, and a tremendous feel. 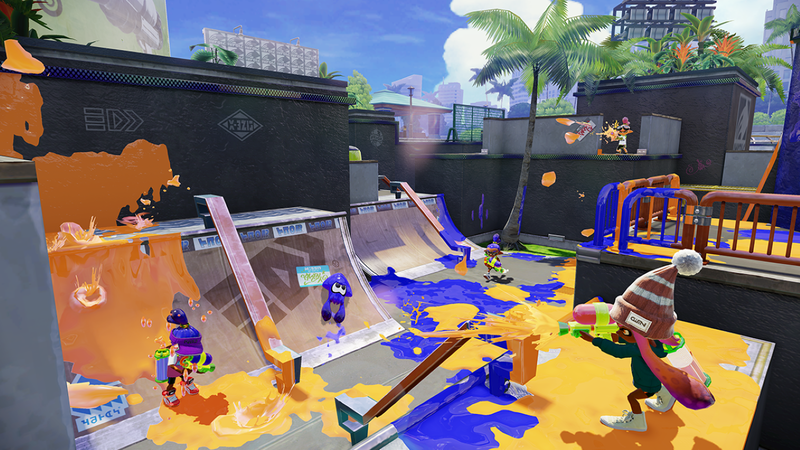 Splatoon has you playing as both a kid and a squid. As a kid inkling, you use a weapon, whether a gun, a roller, or a sniper rifle-like charger, for instance, to try to not only cover the ground and walls with paint, but also unleash paint onto foes to eliminate them. Splatoon's main mode is Turf Wars, where two teams of four players each vie to cover the ground of the map with as much paint of their own color as possible. At the end of the three minute match, the team whose paint covers the most ground of the map wins. Three minutes is a perfect time period for each match, because if you are getting creamed in the current match, it is over before pretty fast. Who knew battle could be such a work of art? As stated, you play Splatoon as both a kid inkling and a squid. When you're a squid, you enter into your team color's paint, skimming the surface of it, and being much faster than if you were running around as a kid. You can even climb up painted walls as a squid to reach new heights. You also need to enter into your side's paint to refill ink. Both running around as an inkling and skimming the surface as a squid have a terrific feel to them. It's certainly a joy to play as both, switching between the two as the battle situation commands. and I'm not talking about being down in the dumps. The GamePad is used to great effect, displaying an overhead view of the map to help you see where your team needs to start painting, defending, and attacking. You can also tap player positions to quickly launch to their location. This eliminates unwanted downtime between being splatted (i.e. K.O. 'd) and returning to the action. That said, you have to be careful when you decide to launch to a teammate's location, as unless you have a specific perk equipped, the enemy can see where you're going to land. You could be arriving in a total ambush. Currently, Splatoon offers non-ranked play and ranked versus. Both feature two maps at a time that the game randomly chooses between. Every three hours, the selection of maps changes. Each time you boot up the game, you arrive at Inkopolis Plaza, where Callie and Marie (get it?) introduce which duo of maps will be played on for ranked and non-ranked battles. This can be tedious at times where you just want to enter the solo mode of Splatoon, yet have to read the dialogue, albeit usually funny, between Callie and Marie's introductions of the maps for online multiplayer. Inkopolis Plaza is where players you've met will populate the plaza. When you decide to play online, you have the choice of entering a random online room or joining up with a friend and entering their room. If the room is full, the game presents a timer that shows when the current game is about to end, and when someone exits the room, you'll have a place there. Despite being able to join a friend on your Wii U friends list, whether or not you're on their team is purely up to chance. As of now, there is no party system-- that will come with a summer update. Instead, each match randomly changes who is on whose team, which is a bit of a letdown. Another oddity with the online of Splatoon is the current lack of matchmaking. It makes it so you might find yourself battling against a team with ranks of 19 and 20 while your inklings are much lower in comparison. This is especially evident in the ranked Splat Zones, a King-of-the-hill style mode where the goal is to capture and hold onto a section of the map by splatting it with enough of your team's paint. As an area is captured, a 100 second counter starts counting down. The first team to have the counter hit zero or have it at its lowest amount when five minutes expire is deemed the winner. 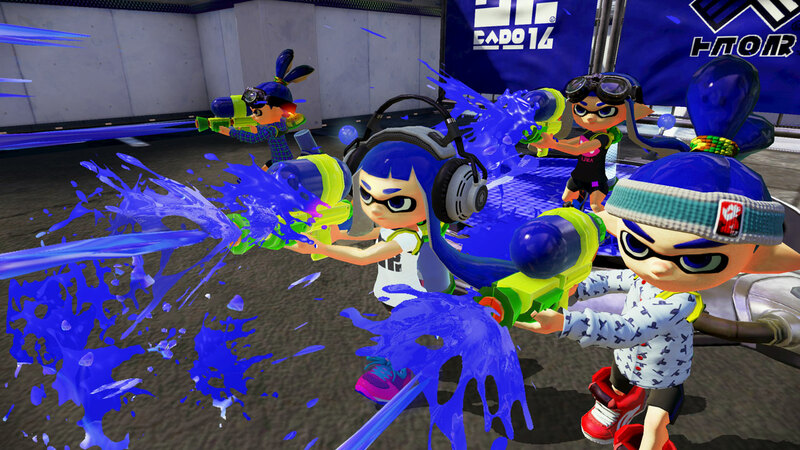 Here's one more issue with Splatoon's online. This is most noticeable in ranked Splat Zones-- the lack of any type of voice chat. In normal non-ranked battles, voice chat isn't totally necessary, as one can look at the GamePad screen to see where parts of the match map require attention, either needing to be painted or needing to be defended from the other team. However, Splat Zones requires a greater amount of communication, as to have the whole team attack a splat zone at once. Since there's no way to communicate this, Splat Zones matches simply turn into total chaos with no sense of real teamwork, a very big shame as the mode has so much potential. the purple team has lost control. When a match concludes, you earn battle points that accumulate, allowing you to increase your rank. You also earn cash to purchase new gear. 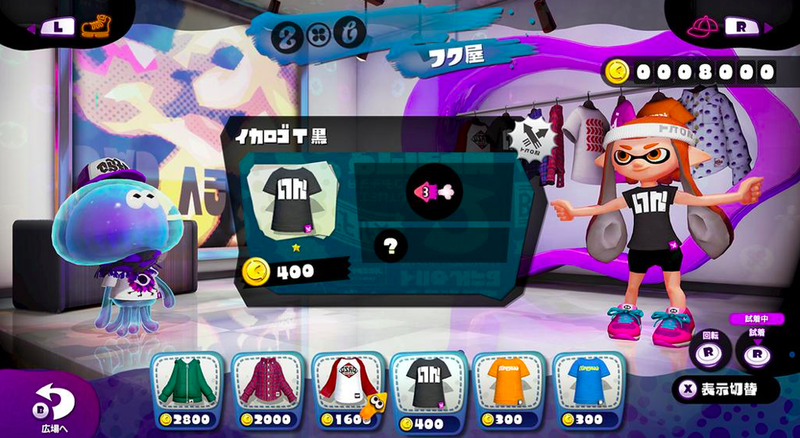 At Inkopolis Plaza, the hub of Splatoon, you can enter into one of four unique shops to spend the cash you earned through matches. There are shops for clothing, headgear, footwear, and weapons. Each gear offers its own perks, such as damage up, defense up, more ink storage, faster squid movement speed, and even things like a ninja squid perk which makes you completely undetectable when submerged in ink. Thus, not only do you get gear to stay fresh and fashionable, but also for battle bonuses. As you continue to wear a piece of gear, eventually secondary perks are added to your gear. While these aren't as strong as the primary perk, they are indeed helpful to have. You're looking mad fresh already! Weapons come in a wide amount of varieties, from the fast ground-covering ability of the paint roller, which is a close range weapon, to the sniper rifle-like charger, that needs a quick moment to charge up before it can be properly fired. Each weapon has its own pros and cons in both painting and battle situations. While it's easy to cover a lot of ground in your team's colored paint with the paint roller, you're also pretty much in trouble if a person with a long-range weapon spots you from faraway. cover up a lot of ground quite quickly. 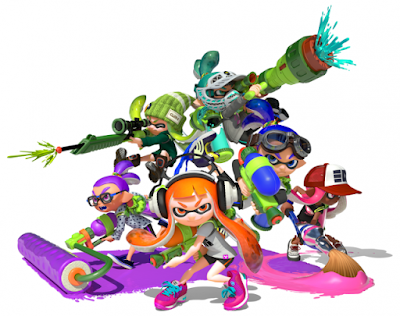 Each weapon in Splatoon comes with a sub and special weapon. 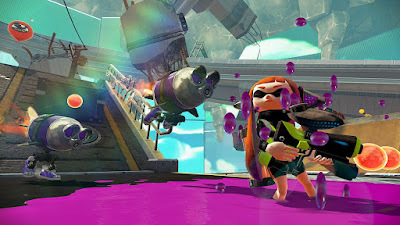 For secondary weapons, there are things like splat bombs that when they explode, cover a wide blast area in paint; proximity mines that hide under the surface, ready to blow an inkling or squid to kingdom come; the sprinkler, a device that can be attached to a surface, wall, or ceiling that sprays an area with paint; and many more. Special weapons can only be used when the special meter is full, performed by painting either bare ground or enemy paint in your team's color of paint. 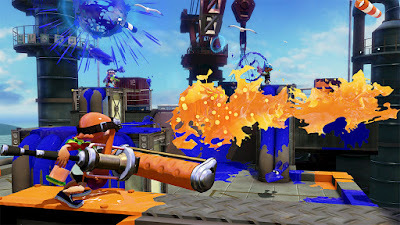 These include temporary shields with the Bubbler, giant tornadoes of paint with the Inkstrike, multiple splat bombs to throw one after the other with the Bomb Rush, among others. The sub weapon Splash Wall blocks enemy paint attacks like so. While Splatoon is heavily online-focused, there is also a 25+ mission single-player mode called Hero Mode to not only unlock some worthwhile content, but also play through some ridiculously clever and well designed levels to build your skills. The Great Zapfish has been captured from Inkopolis Plaza by the Octarians, a militant force bent on eliminating the Inklings. You travel to Octo Valley, the hub of Hero Mode, and enter steam kettles, serving as entrances to levels. Each level's goal is to rescue the Zapfish from captivity through playing through linear levels, launching from huge platform structures, similar to the planetoids in Super Mario Galaxy, each with their own mechanics, set of enemies, and obstacles. The story mode continually introduces new concepts to keep levels feeling fresh, whether it's creative platforming or light puzzles. Each level focuses on a single level concept, such as gushers that launch you into the air as they gush out paint, inkrails that allow your inkling to travel on them when they are sprayed, and platforms that move when you spray their propellers. There are even arena skirmishes that pit you against Octolings in combat. These are the weakest levels of the single-player mode, as they're just the online multiplayer's maps with a single-player twist, but they do show a part of Splatoon that I feel is sorely missing-- the ability to play with bots. Do you enemies mind? I have a Great Zapfish to rescue. Regardless, the handful of boss battles that are sprinkled throughout Splatoon's Hero Mode shines greatly with super creative ways to take down the bosses that come in all shapes and sizes. They're not just bosses that focus on you strong-arming them to surrender; they require some thought to defeat as they are a bit like puzzles themselves. On the whole, Splatoon's Hero Mode lasted me about 6-7 hours of gameplay time. This including collecting each level's hidden Sunken Scroll that reveals some of the history and background of the Inklings and Octarians. I would love an even more robust and lengthy single-player mode for a sequel, as beating the relatively short Hero Mode in Splatoon left me feverishly wanting more. 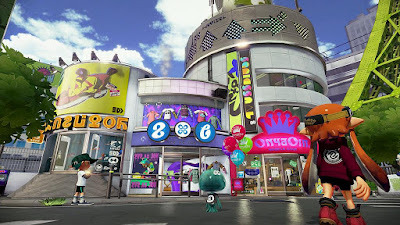 Sure, using an Amiibo in Inkopolis Plaza allows you to replay these missions with different weapons for an added challenge, but it's really not the same. Plus, it's sort of slimy to hide content of any type behind hard-to-find figurines, which basically unlocks on-disc downloadable content. Splatoon ends up being a fantastic online multiplayer shooter, but its current lack of true matchmaking or party invites makes it a bit of an uneven and sometimes frustrating experience. 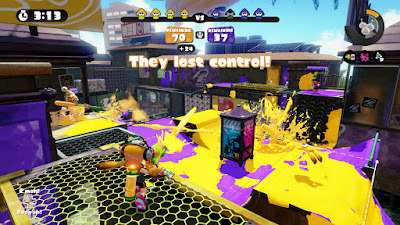 The lack of interesting local multiplayer (a balloon popping mode with one other player does not an interesting local multiplayer mode make) hurts a little, and the lack of bots even if just to replace disconnecting players online hurts a lot. That said, for all that is wrong with the experience, Splatoon is still an amazing game to play. 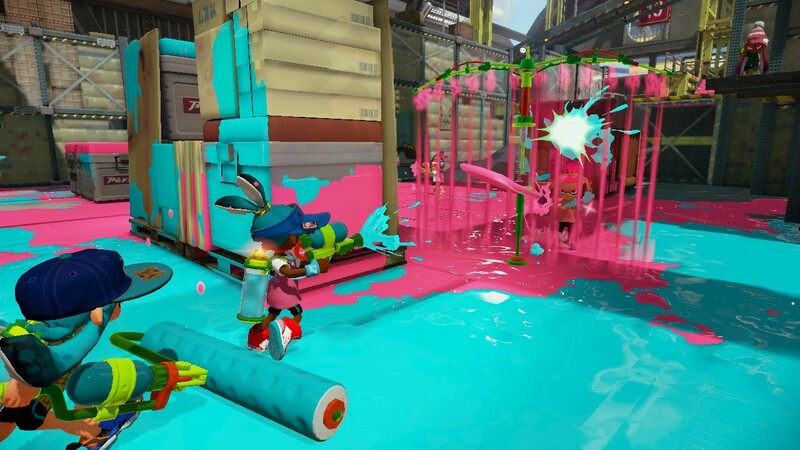 The feeling of switching between a humanoid Inkling and a speeding squid is phenomenal, the concept as a whole is spectacular, the sounds and sights of splatting other players and covering floors and walls are tremendous, and the single-player mode will leave you begging for more. It's not a perfect introduction for Splatoon to players, but it's pretty ink-credible all the same.